Uses:- Rituximab Injection is used alone or with other medications to treat certain types of cancer (e.g., non-Hodgkin's lymphoma). It is a type of medication called a monoclonal antibody. It works by attaching to certain blood cells from your immune system (B cells) and killing them. 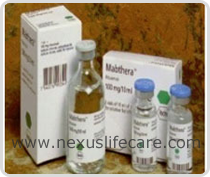 Rituximab Injection is also used with other monoclonal antibodies and radioactive drugs to treat certain cancers. Side Effects:- Headache, fever, chills, nausea, heartburn, flushing, weakness, or dizziness may occur. back/joint/muscle pain, increased thirst/urination, swelling of the hands/feet, tingling of the hands/feet.